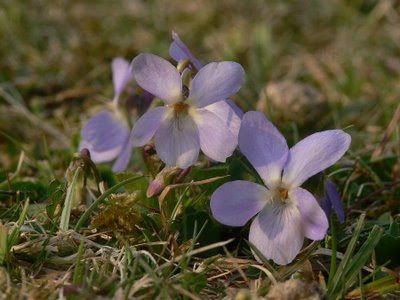 Banstead Botany Blog: Violets are Blue????? Like Daffodils, see previous entry, Violets (Viola species) presage spring but unlike Daffodils I cannot get enough of them. 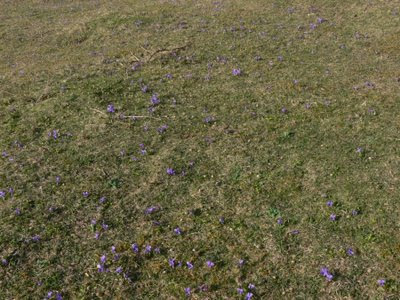 Around Banstead it has been a good year for the various species but special mention must go to Park Downs where there is a spectacular display of Hairy Violet (V.hirta) this year. It is there every year but the numbers and effect vary depending on the level of rabbit grazing. This year is a great year because of the large number of rabbits that have managed to reduce part of the Downs to a sward that a bowling green groundsman would be proud of (although not flat if you know what I mean!). The plants remain firmly tucked into the other vegetation until it seems, the very last minute and then they throw up their flower stems, the rabbits do not seem to relish the flowers at all and so the overall effect from a distance is of a blue haze across the side of the south-facing slope, the picture at the bottom does not do them justice. Normally Hairy Violet tends to have flowers that are closer to blue than purple (?violet?) of other species, a fact immediately observable in the field but not so easy to see from photos because getting typical colours of these shades is heavily dependent of the ambient light. 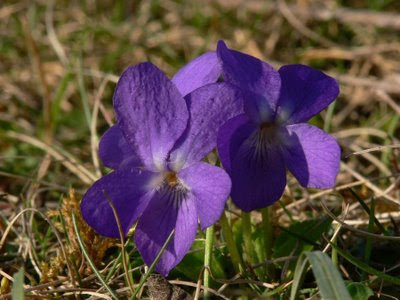 Unlike Sweet Violet (V.odorata) Hairy Violet is rarely found in white although paler blue versions are freely available.